After gaining a point last weekend, Tayport will be hoping to further close the gap on second bottom Fauldhouse United tomorrow. ‘Hoose are currently five points ahead of bottom placed ‘Port, who have one game in hand. Victory, therefore, would move Tayport to within touching distance of their relegation rivals. John Ovenstone’s men took a step in the right direction against Sauchie on Saturday. ‘Port produced an encouraging performance in the 2-2 draw, with the player-boss keen to focus on the positives. “I can’t praise the players highly enough,” he said. 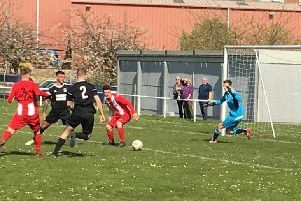 “A couple of big decisions went against us and Sauchie were able to pull the two goals back, but we showed the heart and desire to keep going. There is now greater competition for starting jerseys, with Stefan Elvin the only player carrying an injury. Kick-off at Parkview is 2.30pm.